Louis Armand, Baron de Lahontan (1666-1715) served in the French military in Canada where he traveled extensively in the Wisconsin and Minnesota region and the upper Mississippi valley. Upon his return to Europe he wrote an enormously popular travelogue. 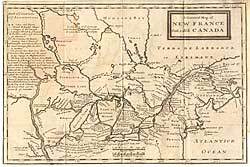 In it he embellished his knowledge of the geography of the Great Lakes region and created several fictions. The immense popularity of the book resulted in his distorted cartography being accepted by several eminent cartographers who incorporated the "Lahontan" concepts into most of the maps of the 18th century.